I’m a big fan of fun candy-free Valentines. 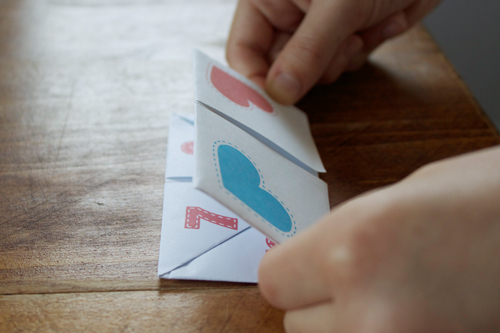 This project was inspired by the mounds of paper fortune tellers that fall from my daughter’s backpack daily. 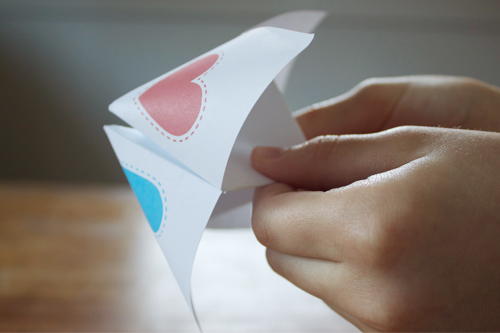 Apparently, making paper fortune tellers is THE thing to do in her fourth grade class. I have a feeling her classmates are going to love these. 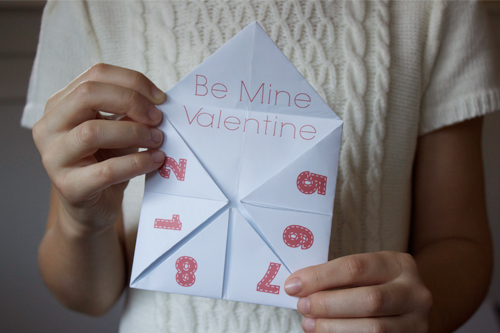 To make some paper fortune teller Valentines with your child you’ll need to print out the PDF and have a paper trimmer or scissors handy. 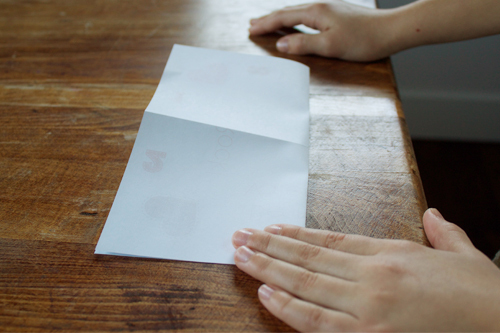 Cut the excess paper from the fortune teller along the dotted line. Your fortune teller should be 8.5″ x 8.5″ after it’s trimmed. 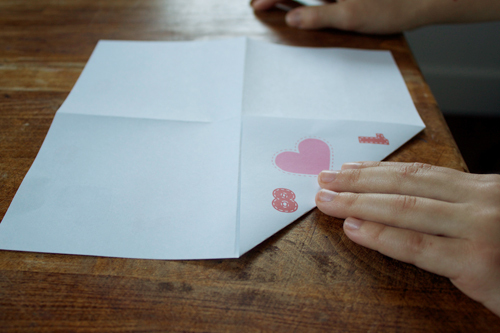 Fold the fortune teller in half, making a nice crease. Make another fold, this time going in the opposite direction. This creates a “X” in the fortune teller when it’s opened. 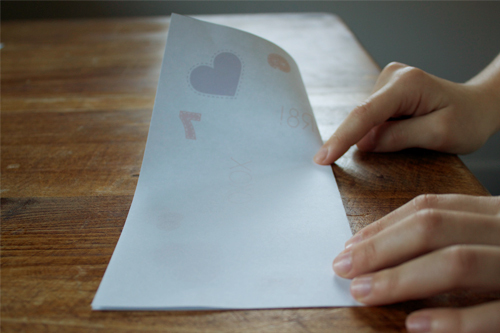 Turn the paper so the printed side is facing down on the table top. 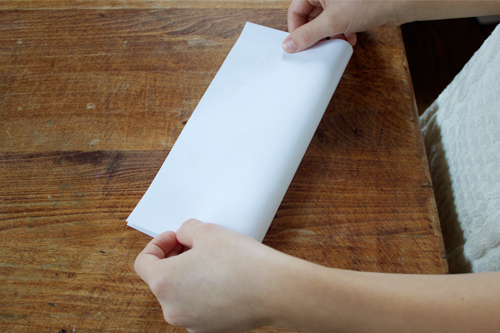 Turn one corner at a time towards the center point of the paper and make a nice crease. 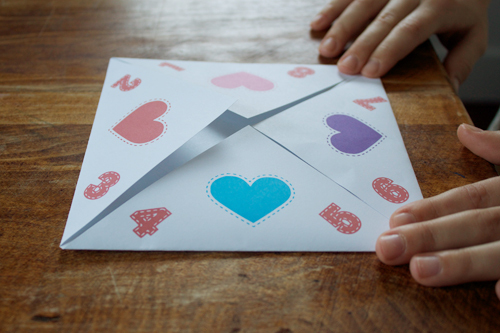 Flip the fortune teller over so the heart and number graphics are facing down on the table top. 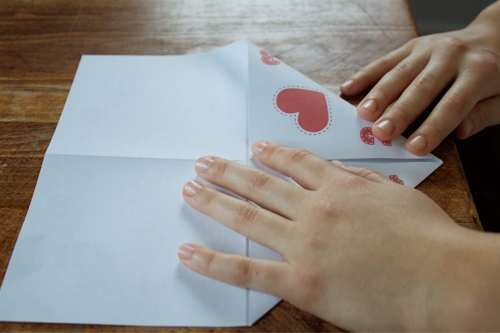 Next, turn each corner one at a time, towards the center of the paper. When you are finished, all of the numbers should be visible and your fortune teller should be in a nice square. 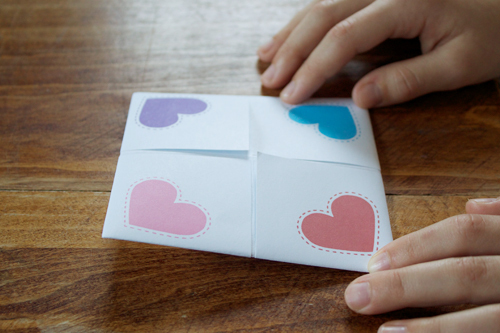 Flip the fortune teller so the four colored hearts are visible. 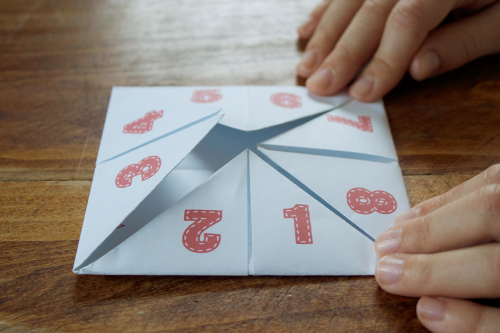 Fold the fortune teller in half making a nice crease and then re-open. Do the same thing, this time going in the opposite direction. 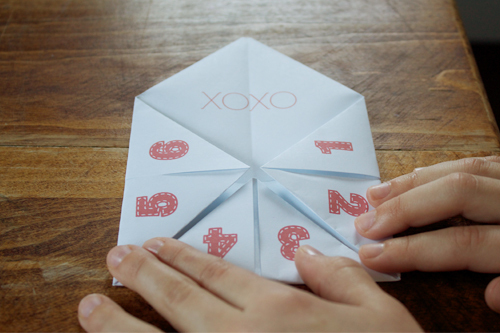 Slip your fingers inside the fortune teller as shown in the images to fluff. 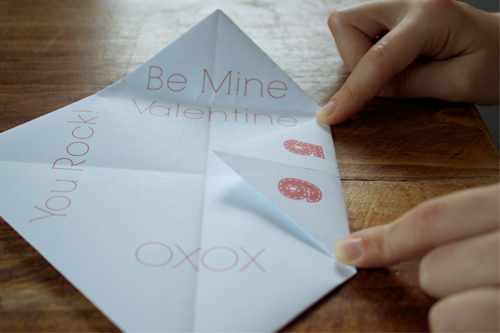 You can print your own fortune tellers. Download the free pdf here! Oh! My 6 year old son discovered Fortune Tellers this summer at camp, and was hooked! Being a boy, he’d come up with fortunes along the lines of “You will wake up and be a fish”. Do classes share Valentine’s in France? I’ve lived in a few countries and only ever seen it in the US. I love the idea by the way. Fortune tellers? I’ve always called them Cootie Catchers. 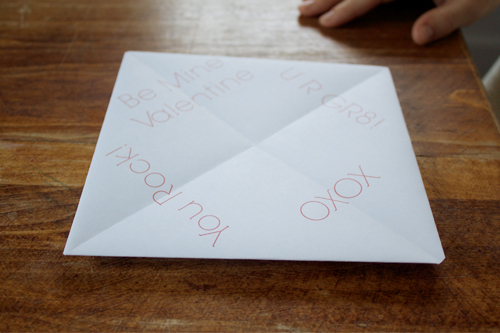 Oh, I love Cootie Catchers. Thanks for the free printable. My daughter will love this. Fun! When I taught middle school, I decided to harness the love of fortune tellers by making them into vocab study tools. They are always a hit! Thanks for sharing the tutorial! I’m forwarding this idea to my daughter in Mesa AZ. She’s a resource teacher for 7th graders who read at 5th grade level. The vocab study tools/fortune tellers will be a creative way to improve their literacy. Thanks! Thanks so much for this cute tute! I’ll be sharing it on my paper-loving site. I am looking for a craft for the class party. Do you have a version of this that isn’t colored in so that the kids can do that part? Maybe just an outline of the hearts and the numbers? Thanks! I love it; thank you for sharing! My daughter is going to be thrilled, but I must confess the ocd part of me is bothered that the 1 is upside down. 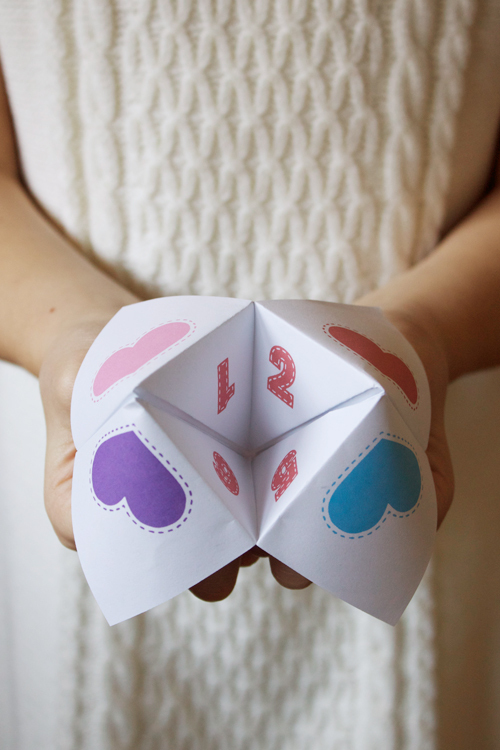 We just told our daughter (8) we are having another baby using a fortune teller…she loves them. This one would have been so much cuter than the one I made!! We will be using these as well!! Cute! I remember when I was in the 4th grade making lots of those. The kids will love them! so perfect! thank you so much! My 3rd grader loves the 3D lolly pop valentine and now this is perfect for the kindergartener. Thanks so much for sharing!!! Lovely idea. I wonder if my 3rd grader son will dare to give them out to the girls in his class!!! So thrilled that you posted that tutorial. My daughter came home with one yesterday unfolded and for the life of me I could not remember how to do it. She will be thrilled to see that I figured it out. so cute Danyelle. such a great idea. I would have been head over heels for this in 4th grade. 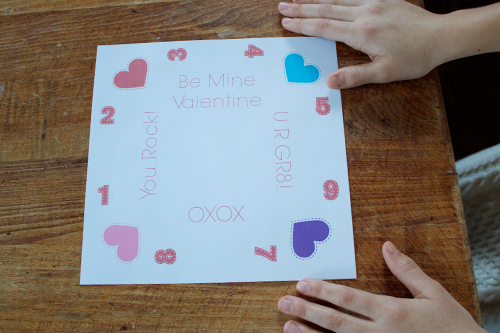 What a great idea… I also have a daughter in fourth grade and we’re looking for Valentines to share with her class… This is perfect!! Thanks for sharing!! I am SO glad you posted this! I’ve been wanting to do an art piece with these and I wasn’t sure I could remember how to make them. How fun! Definitely takes me back to my school days! This is a fantastic idea – so cute! I’m having a little trouble getting it to look right, though, and am wondering if some of the numbers might have shifted on the PDF: 1, 7, & 8 get caught on the edge when folded up. I have the same problem… My pink heart numbers and purple heart numbers end up half way hidden on the other side of the fold. They seem further away from the corner point than the red and blue hearts. I really love these! Super neat-o! 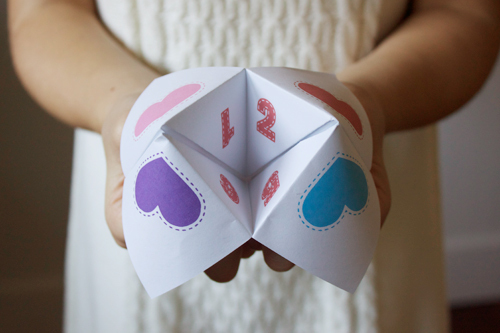 Julian loves fortune tellers and I think we may just have to make these for his valentine exchange at school. thanks for taking the time to make this printable and post it! 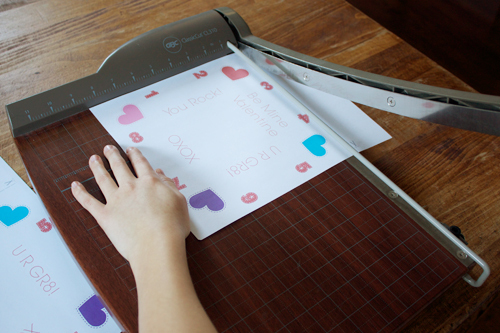 we may just print a bunch of these and use them for school valentine’s. i think the kids would love it. thanks Danyelle – my fourth grader thinks these are the coolest valentine’s ever. We just printed them up to pass out this week. These are just adorable and I love the no candy part too – I’m printing it! I’ve also shared this on my post today on Valentines! Thank you for this idea. My husband & I remember these from grade school years ago. 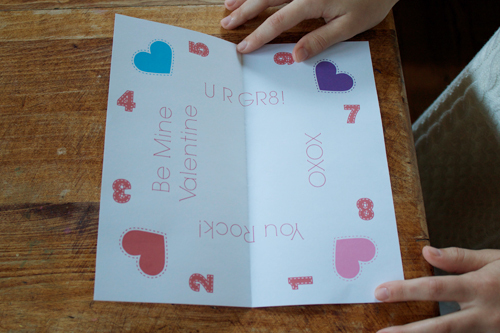 I have these ready for my kids for this V’day. Thanks again for the tutorial AND the free download! Happy V’day. These are so cute. I totally remember making these in school. How fun ! This is nice! Thanks going to make it for my daughters project. I just made one for my niece! We used to do these all the time when I was a kid. FYI – The numbers 6, 7 and 8 are off a bit, as well as the purple heart. They are under the folds and hard to see. with links back to your post. Happy Valentine’s Day. So cute! And so are the Madlib Valentines! Pinned so that my neice will see these for the kids! When I printed them out the pattern was off. 3,4, 5, and 2’s were on,but the other numbers were off. I followed all directions. Super idea! 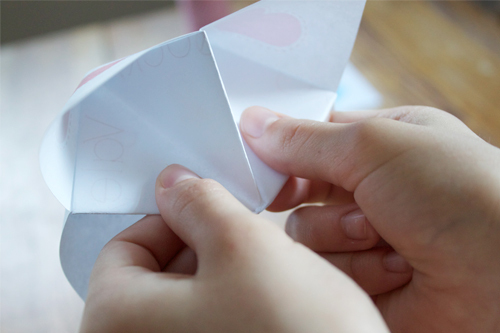 Fortune tellers were so much fun when I was a kid. I’m happy to see that kids still enjoy them. I’ll have to save this idea for when my son gets older. He’ll love it as a grade schooler! Thank you! Now I see it’s from 2012, so realize I will need to try a different project to get this in the mail in time. Darn… this was going to be so much more fun for little nieces & nephews than just a card…. So how did you package these? Or did you just hand them out as is?